Okay, so I want to fully disclose that I have no idea where this recipe originated. It was passed to me through a friend; If you know..Please let *me* know so I can give credit where credit is due. It's definitely not my intention to steal a recipe (or anything) and pass it off as my own. Phew, okay.. With that being said, this cake is SO delicious, I just *had* to share. 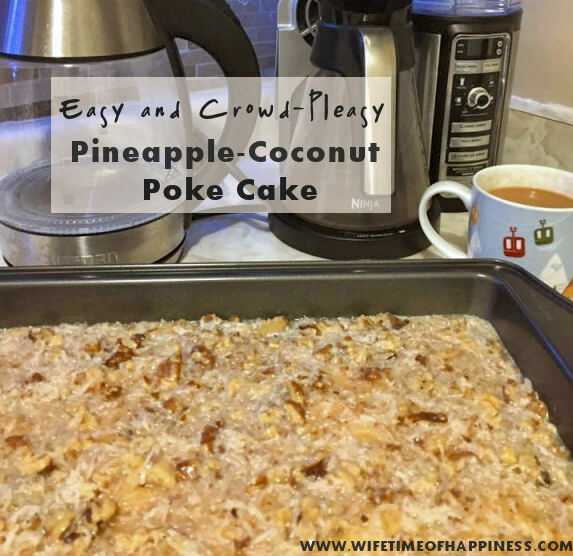 This entry was posted in Recipes and tagged cakes to make for a buffet, cakes with pineapple, coconut cake, coconut coffee cake, coconut pineapple cake, coconut poke cake, coconut poke cake recipe, delicious summer cakes, easy cake, easy cakes, easy coconut cake, easy coconut pineapple cake, easy pineapple cake, easy poke cakes, easy summer cakes, goto cake, how to make coconut cake, how to make pineapple cake, pineapple cake, pineapple coconut, pineapple coconut cake, pineapple coffee cake, pineapple poke cake, pineapple poke cake recipe, poke cake recipes, summer cakes, summer fun cakes.